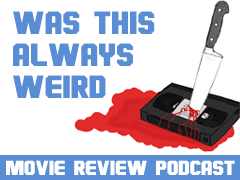 "I wish they had a clear point of view"
The film was was billed as "the most shocking tale of carnage ever seen" and the WTAW guys have to decide whether that was carnage as in glorious gorefest, carnage as in absolute trainwreck or just plain weird. Contains side-tracks. Many many sidetracks.